As exhausted as I feel, I am still feeling the bliss of returning from The Big Traveling Potluck this weekend in Temecula. This was different from any other blogging event I have experienced. I have so much to tell you guys, but that’s for a future post! Today is my Dad’s B I R T H D A Y. He’s turning 40; he wishes. HA sorry Dad. 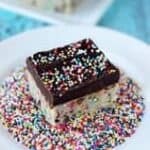 Last year I made a version of an ice cream cake, which is the staple birthday cake in our house. He told me that he wanted to be able to make a smaller version since he is obviously the only one home to eat it. So I sent him some 6” pans to try out. Sure enough he texted me last night to tell me he was making his annual ice cream cake. Five fun facts about my dad. 1. He is the reason I know how to snowboard (and ski for that matter), how to fish, how to play soccer, baseball and basketball. Almost of of which he still does himself. 2. He used to fight forest fires, and how he still goes out on duty to work with the public in effected areas. 3. His Zucchini bread recipe can be found here. 4. The first time he met my boyfriend, he told me he liked him because he drove a Ford and owned a drill. 5. His Christmas/ birthday list always includes mostly practical items like bird seed, socks and printer toner. Since I was away all weekend, I didn’t have time to make him a cake this year. 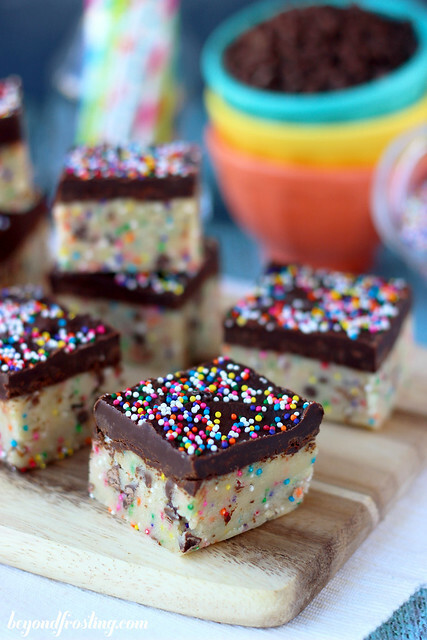 Instead, I made Funfetti Cookie Dough Truffle Bars. 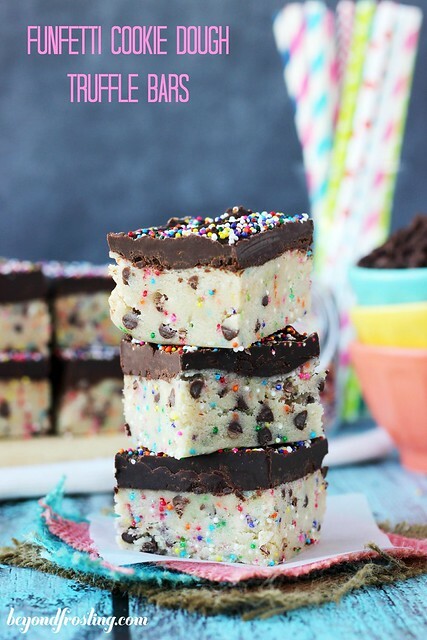 It’s kind of like a birthday cake in that it can be sliced, it has chocolate and sprinkles, and I don’t want to share it. That’s right, I want it all to myself. 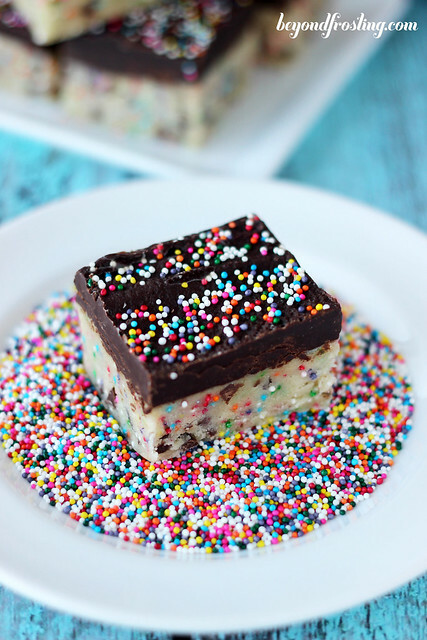 I have a thing for sprinkles. They just make everything so much more fun. 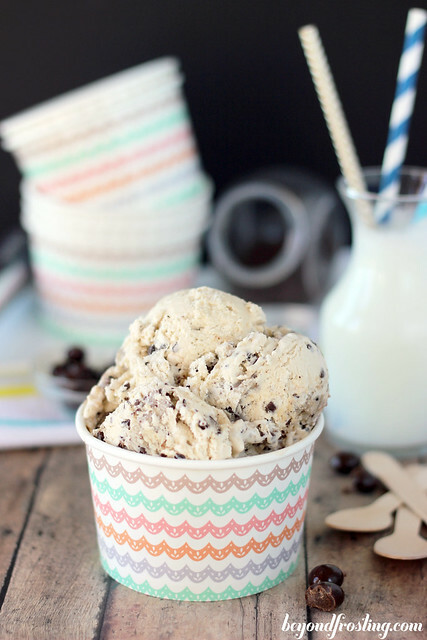 Oh, and cookie dough, I mean you can’t go wrong with cookie dough, right? So the glorious thing about these bars is, it’s just like a cookie dough truffle but without all the work. There is no rolling the dough, or chilling it. There is no dropping the cookie dough balls in a bowl of melted chocolate and making your kitchen a disaster. Just press the dough in a pan, pour the chocolate over top and let it set. Seriously, there are so many flavor varieties you can do with this. I don’t know about you, but whenever I can save myself some time and mess, I am a happy camper. 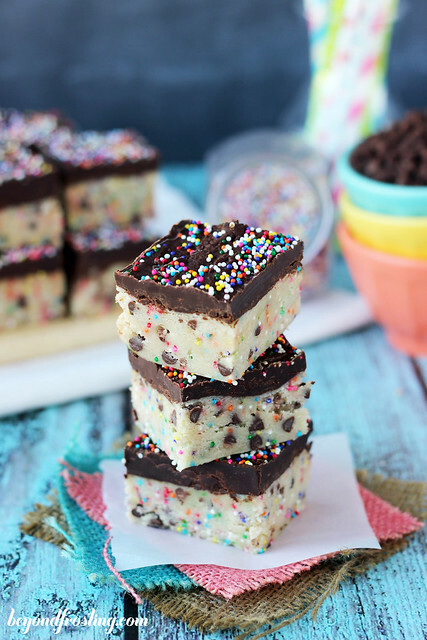 A cake batter flavored cookie dough bar covered with melted chocolate truffle. Add flour, dry cake mix and salt. Mix just until combined. 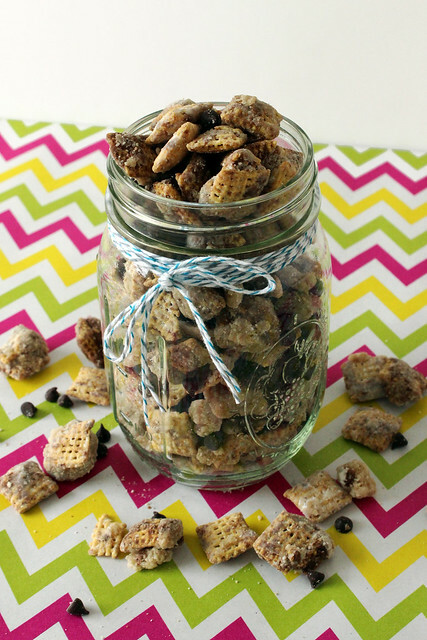 Mixture will be crumbly. Add vanilla and butter extract and milk. Mix until dough is soft. 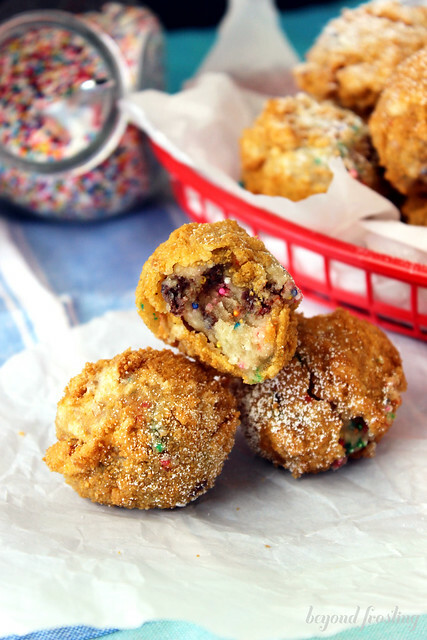 Add chocolate chips and sprinkles last. Line a 9×9” pan with parchment paper, over the top edge. Empty the cookie dough into the pan and gently press dough into the pan with your fingers. In a microwave safe bowl, combine chocolate chips with heavy cream. Microwave on high for 60 seconds. Remove bowl from microwave (careful, it’s hot!). Whisk together until chocolate starts to melt. Return it to the microwave for another 30 seconds. Remove and whisk until smooth. Pour melted chocolate over top of cookie dough. Top with additional sprinkles. Leave on the counter for at least 30 minutes to allow the chocolate to cool then refrigerate until firm. Remove from refrigerator 20 minutes before serving. 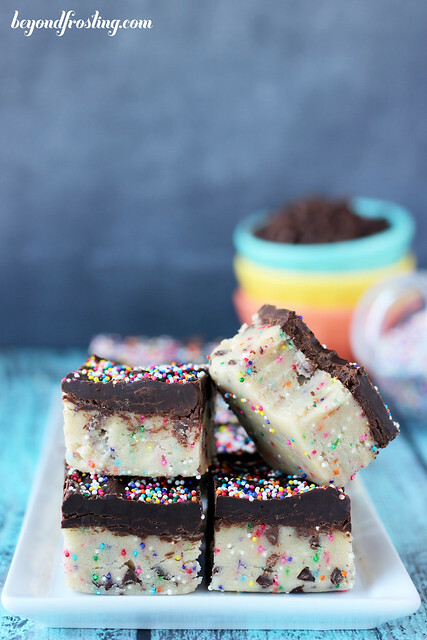 Lift parchment paper out of pan and cut bars into squares. Love this! So many of my favorite things rolled into one. Especially sprinkles. Pinned – thanks for sharing! Hi Tom- do you have boxed cake mixes in the UK? I apologize I am not as familiars with the product offerings. 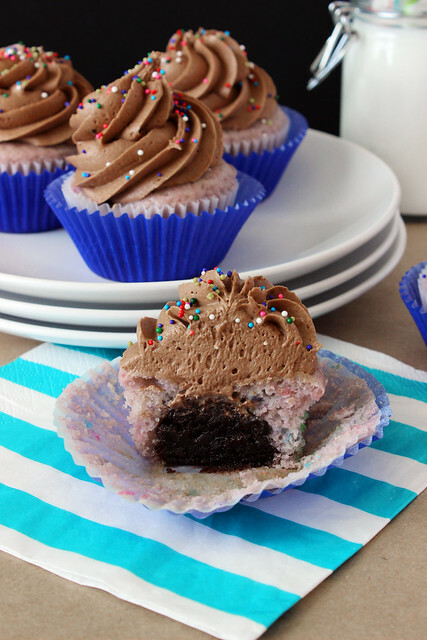 We have boxed cake mixes where all you need to do is add egg, oil and water and boom, you have a cake. 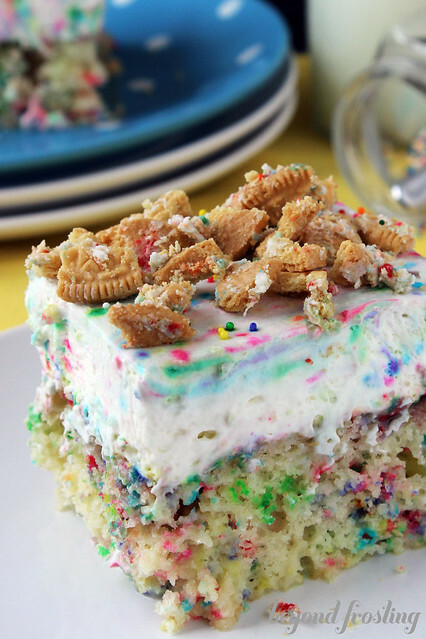 This is the type of “cake mix” I am referring to. You can try substituting instant vanilla pudding mix. Do you have that?